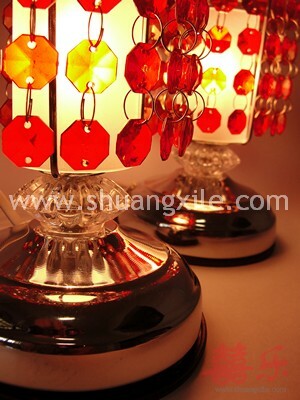 Modern chinese bedside lamps with improvised design in the ruby crystal pieces - Its now looks more classy. 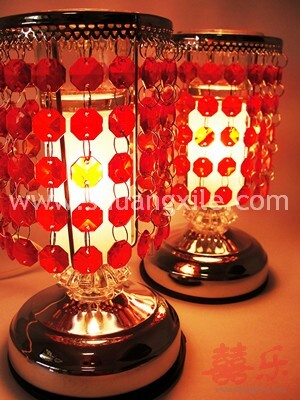 This will definately exhibits the romantic ambience to your wedding room with the clear ruby crystal enhancement. Just the right color - RED plus the modern style crystal design! 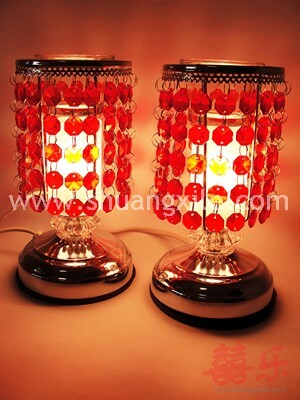 There are 3 controllable modes, low-medium-high to control the brightness of the lamp. This lamp can also be used for aroma therapy as it comes with the small bowls on top of each lamp! Bedside lamps shall be turned on from the day of bed setting until the actual wedding day. It means for the wishes of growing next generation for the wedding couple (生子添丁）.